Congratulations! You deserve every single one. Blackwater was one of the most thrilling hours of TV I've ever seen in my life. Congrats!! Blacwater was an epic episode. I wish I could have been there, but I graduated from Air Force BMT the week before and I am at tech school now. One weeks difference and I could have gone because it is in San ANtonio, but that is how life goes! Just keep doing what you do George, I love your work and can't wait for the next season and more importantly, the next book!!! Dance with the Conga Rats! Congratulations, George. You earned it. Clearly. Totally deserved. Enjoy #6, George. Congratulations, George! It was (and still is) my favorite episode. Congrats George! Looking forward to season 4 and more accolades for you and all involved with the Game. My favourite episode from season two. Congratulations. You more than deserve it. It was wonderfully written and executed. Kudos to everyone involved and congratulations!! When I saw this episode for the first time, I thought "this, looks like a movie! wonderful" I enjoyed so much that I bought the blue-ray and watched it with your commentary. You were so great and thoughtful. Later on, I bought all the books and read it. theN, even thought this is supposed to be an adaptation, I could not compered it with the chapters of ASOIF. Congratulations, sir - very much deserved! 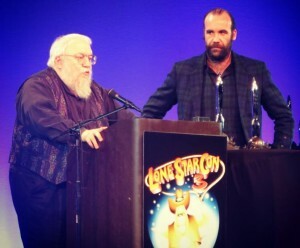 Congrats to you and all the others who make this show happen season to season... you certainly deserve it George! 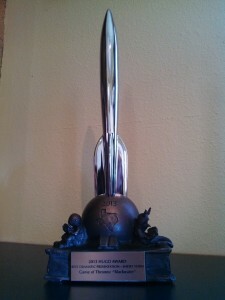 Hey do George or Ty know that A Podcast of Ice and Fire won a Geekie award for best podcast?